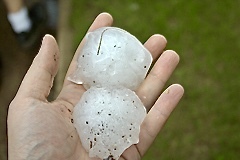 Do you have hail damage from the recent storms in Midlothian, TX? Frustrated by roof damage caused by recent hail and wind storms in Midlothian TX? It’s time to call the roofing pros at Elite Roofing and Consulting to repair or replace your roof. We are the premier company for roof repair Midlothian, TX and we are here to serve you. Our company was started by a licensed insurance adjuster who recognized the need for honesty and professionalism in the roofing industry. We promise to help you through the entire process, walking you through the claims process, and restoring your roof to like new condition. Sometimes hail storms can be unexpected and our roofs just can’t handle it. We can take care of any roof damage sustained in these storms. Most thunderstorms that occur in Dallas bring torrential rainfall, gusting winds, and softball sized hail. Each of these different harsh weather conditions can wreak havoc on any type of roofing system, and it is always recommended to have your roof inspected after a major Texas storm. A simple inspection can help to prevent a number of larger issues in the future. Our roofing experts have been working in the Midlothian area for years and know exactly what to expect and look for after a large storm. We can help determine what small issues need to be repaired in order to save your from larger issues later on down the road. We are your roof repair Midlothian TX experts, here to help you in any way. Elite Roofing and Consulting provides professional roof consulting services in the inspection and evaluation of commercial, industrial, and residential roofing systems. We always tell our customers that one of the best investments you can make with your residential or commercial roof system is to hire a professional to make sure your roof is secure, energy efficient, waterproof, and correctly installed. This is yet another way to save yourself from unrepairable roof damage in the future. Whether you need a professional roof consultant for an insurance claim, underwriting requirements, real estate transaction, independent third party inspection, expert witness, or simply for your own peace of mind – you can depend on Elite Roofing and Consulting to always give you an honest evaluation after a thorough inspection of interior and exterior factors. If your roof is damaged in one of the many storms in Midlothian, be sure to give us a call as soon as possible. Elite Roofing and Consulting was started by a licensed insurance adjuster who recognized an urgent need for honesty and professionalism in the roofing industry. If you need help with an insurance claim, we will be there to assist you along the way. We are known for having a great working relationship with all insurance companies and adjusters. When looking for roof repair Midlothian TX, Elite Roofing and Consulting is who you should call. With years of experience in roofing and re-roofing we have dozens of commercial roofing projects under our belt. If your commercial roofing system has been damaged due to a hail or wind storm in Midlothian, we can help! Our experience with insurance claims and roof inspections makes us the best option to get your commercial roof system back to like-new conditions in no time. We repair and install all types of commercial flat roof systems including single ply TPO and PVC, spray foam and coatings, standing seam metal, modified bitumen, and built-up roof systems. In the past we have worked with numerous commercial building including Jack in the Box and Applebees restaurants using a mixture of roofing materials, churches utilizing metal roofing, and hotels using TPO single ply roofing. The bread and butter of our roofing services lies in residential roofing and residential roofing repair. We repair and replace all types of residential roof systems including asphalt shingles, wood shakes, clay and concrete tile, and standing seam metal roofing. We never limit ourselves to only residential roofing, we also work with different residential communities and apartment complexes. Just know that we can handle any Midlothian roof repair project big or small. Elite Roofing and Consulting is BBB accredited, insured, and bonded for your protection and peace of mind. Our biggest concern is always the happiness and satisfaction of our work with our customers and it is shown by the way conduct business. Our goal is to consistently install the best roofs in Texas, deliver nothing but superior customer service, and stand behind our work with the best warranty in the business.